Assist Brotherhood members in the fight against the Penitus Oculatus assault. Astrid performing the Black Sacrament using her own body in the ritual. Hide in the Night Mother's coffin. Return to the Night Mother. The Sanctuary is under attack! There should be several guards outside the sanctuary when you approach it, along with the horses and carriages that they arrived in. Deal with them and head inside the sanctuary. Festus Krex can be found dead outside, pinned up against a tree by arrows. There are also several stacks of barrels holding oil, hinting at the way the Penitus Oculatus plans on destroying the sanctuary. When you enter the Sanctuary, you will notice the entire place is on fire and structurally unsound. 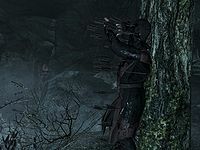 Close to the entrance, you will overhear two members of Penitus Oculatus discussing who among the Dark Brotherhood turned traitor. Next to them you will find the body of Veezara. After their conversation, they will head towards you. Deal with them as you see fit. Astrid's and Arnbjorn's rooms are empty, so head down the stairs into the central room of the sanctuary. You will find Arnbjorn in his werewolf form fighting Penitus Oculatus agents. You can try to help him, but his death is scripted and he will die even if you kill the agents around him. There is no way for you to save him. The corpse of Gabriella lies in the next room as does Lis. Arnbjorn goes wild as a werewolf. Continue through the sanctuary, avoiding the flames until you find Nazir. When you find him, he is locked in a duel with one of the agents, Arcturus. Assist him by killing his attacker and talk to him. His concerns that you might be the traitor are erased when you save him. Follow him in his search for an escape. As you follow him while he searches for a way out, you should run past the room with the Night Mother. She will call out to you, telling you the only safe place is in her coffin. Make sure Nazir is out of combat, then run and open the Night Mother's coffin. Walk into it, and it will close around you. In the darkness of the coffin you will hear explosions and sounds of the sanctuary coming down around you. After they end, you will hear the voices of Nazir and Babette talking as Nazir tries to unearth you. When Nazir opens the coffin, you find yourself in the main room of the sanctuary. Apparently, in the explosions, the coffin was thrown through the stained glass window. After you step out of the coffin and talk to the two survivors, the Night Mother will talk to you once again and inform you that Astrid is still alive. She will ask you to find her. Nazir and Babette will follow you after you inform them of what you've just heard. The Night Mother tells you to go find Astrid. 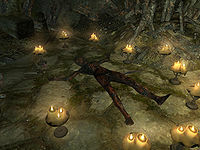 Take the stairs up to Astrid's old chambers and you will see a horrifically burned Astrid stretched out on the floor in her hidden chamber with candles surrounding her. She has performed the Black Sacrament, prayed to the Night Mother and placed herself in the center of the ritual with the Blade of Woe (her symbol of status) beside her. Astrid reveals that she is the traitor. She betrayed you because she wanted things to go back to normal with the Dark Brotherhood. She was skeptical of Cicero and the Night Mother and envious of you for being named the Listener. With her last moments, burned and dying, she performed the Black Sacrament on herself and asked for a contract. When you arrived, her skepticism of the Night Mother disappeared, since she knows that her prayers were heard. She reveals that what she prayed for was a mercy killing. She wants to be put out of her misery. You can retrieve the Blade of Woe found next to the dying Astrid, as an optional step. 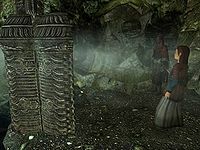 Once you kill Astrid, she will thank you with her dying breath and the quest will update and direct you to return to the Night Mother (in her coffin). Nazir and Babette will comment on her death with anger and pity for their former leader. Once you return, the Night Mother will talk to you, instructing you to fulfill the Brotherhood's contract to kill the Emperor. She suggests talking to Amaund Motierre in Whiterun, but to let Nazir know of your plans first. From hence begins the next quest, Hail Sithis! Even a non-offensive spell, such as Healing Hands, will kill Astrid after she performs the Black Sacrament. If you pickpocket Astrid before joining the Brotherhood and steal the Blade of Woe and then do this quest you can have two Blades of Woe. After killing Astrid, her body can be resurrected with spells or powers like any other body. She will not have any dialogue in this state. If you have any valuables stored in the sleeping area of the sanctuary, be sure to retrieve them after you save Nazir. Once you emerge from the Night Mother's coffin you will not be able to access that area again. Deceased Brotherhood members had recorded dialogue regarding Astrid's Death and the discovery of her betrayal. [verification needed — possibly from mod] However, these were ultimately cut by the developers. You may become stuck in the Night Mother's coffin. After getting out of the Night Mother's coffin and speaking to Astrid, you may be frozen and unable to do anything, and you will be unable to receive the Blade of Woe and kill Astrid. If this happens, reload a previous save. There is a glitch in which you hear everything twice after entering the Night Mother's Coffin. It resets after Nazir releases you. ? If you try to access the Night Mother's coffin as a werewolf, the coffin will never close, even after you have reverted back to your normal self. ? When you must kill Astrid, if you fail a reverse-pickpocket attempt on her, she will jump up and start to attack you. When you have to assist Nazir, sometimes the agent he is supposed to be fighting doesn't spawn, despite the arrow pointing to where he should be. ? Reloading a previous save should fix this. In some instances, if using a spell that is not intended to damage your opponent on Astrid, such as soul trap, she will stand up from her position and will attempt to attack, only to die immediately. 10 I have returned to the Sanctuary in the midst of the Penitus Oculatus' assault. I must assist my fellow Family members any way I can. Objective 30: Kill Nazir's attacker! 200 Finishes quest Not only have the Penitus Oculatus killed most of the Family members and burned the Sanctuary, Astrid also revealed herself to be the one who betrayed me. But there is still hope - the Emperor is still in Skyrim, and I have a chance to fulfill my contract with Amaund Motierre. The following empty quest stages were omitted from the table: 0, 1, 2, 3, 4, 7, 55, 255. On the PC, it is possible to use the console to advance through the quest by entering setstage DB10 stage, where stage is the number of the stage you wish to complete. It is not possible to un-complete (i.e. go back) quest stages, but it is possible to clear all stages of the quest using resetquest DB10. 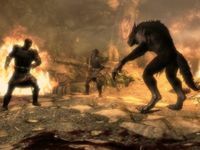 Prev: To Kill an Empire Up: Dark Brotherhood Next: Hail Sithis! This page was last modified on 21 July 2018, at 15:50.